To come up with this list, many factors were put into consideration as the separators and tiebreakers. Notably, we looked into weight, comfort, breathability, water resistance and durability as the major factors. Other smaller factors were used as tiebreakers to separate closely similar shoes. Therefore, expect nothing short of the best women’s hiking boots. The Keen Women’s Durant hiking boot prioritizes comfort in a women’s specific fit so that you remain confident while walking in rough, wet and slick terrains. This lace-up hiking boot’s fit runs half a size smaller making half a size up from your normal size the correct fit. Coming in Gargoyle/ Capri breeze color and featuring logo callouts on its tongue, side and heel; this is the perfect synchronization of style and functionality. With each boot weighing 16.7 ounces, they are exceptionally lightweight. You are assured that you will not lag behind due to additional weight on your feet. Notably, the synthetic sole it features being significantly lighter than leather, contributes to this boot’s minimal weight. This boot features a removable dual density EVA foam foot-bed that is firm yet comfortable. The anatomically shaped foot-bed serves to keep you steady and protects your feet from rocks and other hard particles along the trail. It also features Polyurethane (PU) heel midsole whose cushioning provides comfort with every step. Its dual compound rubber outsole further guarantees good traction on moist surfaces in addition to having shock-absorbency. This gear’s comfort further extends to its excellent arch support which reduces the strain on your feet. Its height being shorter than the shin but tall enough to cover the ankle, provides good ankle support to stabilize both you and your load. 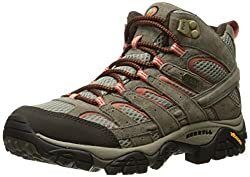 The Keen Women’s Durant hiking boot is comfortable right out of the box and offers plenty of room in the toe box such that you can comfortably move and curl your toes. With mid-height and no break-in period, this American-made boot can double as a daily shoe if you get that snug fit. For ventilation, the Keen Women’s Durant hiking boot sports the KEEN.DRY breathable waterproof covering. This coating allows sweat to get out, leaving your feet dry. It also features a microfiber lining that functions to draw moisture from your feet. The construction of this boot is top notch such that even through puddles, the KEEN.DRY membrane alongside the waterproof nubuck leather keep water from getting in. Even when walking in rain, while the rest of your body may be wet, your feet and socks will remain dry. You can thus comfortably go about your hike through the dirtiest of terrains without leakages or even debris getting in. This gear is made of leather and synthetic soles. It promises a long shelf-life owing to its leather-make that is not only durable but also abrasion-resistant. The protective toe cap it hosts also ensures that your gear is protected from scrapes and scratches. On the flip side, although the synthetic material minimizes the boot’s weight, the tradeoff is that its stitching makes the boot prone to wear. While most footwear focus solely on the breathability and waterproof components, this boot entails KEEN.DRY membrane which is integrates CleanSport Odor control. Thus not only will your feet remain dry but also fresh after your trip. Although the heel lock is great, it requires a lot of yanking. The Oboz- Women’s Bridger B-DRY Hiking Boot is available in rio red, walnut and cool gray colors. The aesthetic gear that comes up over the ankles is embellished with logo callouts on its tongue collar and toe. Weighing 16 ounces per boot, the pair is extremely lightweight. This boot is customized for women with its slightly wide toe box and narrower heel area. This construction keeps your foot in place while giving your toes room to wiggle. The narrow heel area fits just snug enough to avoid a loose heel. The insole of this boot has been designed with five features that work together to enhance your comfort. These entail a high density EVA sculpted, high density EVA deep heel cup, EVA pods and medium density EVA backed up by a moisture wicking top layer. The Eva sculpted arch and medium density EVA integrated throughout the insole offer ultimate support while the deep heel cup enhances both stability and support. In the same way, the EVA pods provide shock absorbency while the top layer keeps moisture at bay. This footgear’s midsole features a nylon shank for support, mid-foot rigidity and stability. More importantly, this feature serves to reduce your load. To avoid the feel of rocks and other gravel while walking, this boot has a rubber outsole with multi-directional lugs. Not only is this feature protective but also attributed for great traction. On the flip side, the streamlined lugs have a tendency to retain mud and might cause discomfort while cleaning. Nonetheless, with such a sturdy tread you will definitely not slip in slick areas. Note that this boot requires little effort to pull on and has minimal break-in time. It also has great ankle support when correctly laced. Although the lacing system may seem insignificant to the level of comfort, this boot’s round laces may bother hikers as they tend to come off easily. Even so, this boot is among the best for hiking and backpacking as your comfort is guaranteed. For aeration, this boot features B-DRY whose mechanism lets sweat escape from your feet. That way, your feet are protected from that slimy feel when sweating. You will be pleasantly surprised by how well this boot holds up in wet conditions. This is due to a waterproofing system known as B-DRY that keeps moisture out while walking through water-logged areas. The Oboz- Women’s Bridger B-DRY hiking boot is a high quality boot made of an all-leather upper and synthetic sole. The leather material accounts for its wear resistance and long shelf-life. The Timberland Women’s Chocorua trail boot is a firm and supportive gear that is available in brown/ olive green. It is true size so you need not alter your shoe size for a good fit. Weighing 15 ounces, this boot is by far one of the lightest hiking boots. The dual density EVA midsole it features offers lightweight cushioning which contributes to its minimal weight. For comfort, this gear offers a flexible forefoot. Although stiff at first, this is but an intermediate feature that minimizes as you break-in. The flexible forefoot is accommodative of all-day walking comfort yet stiff enough to not feel rock on the trails. This boot sports a removable dual density EVA foot-bed that provides support alongside a dual density EVA midsole for cushioning. The footgear further features a rugged rubber outsole that provides great traction. You will remain confident and comfortable while walking on both rocky and slippery terrain. For that tailored fit, this boot incorporates an adjustable lacing system that contributes to its ankle support. The heavy duty round laces it features are lengthy enough to tie securely. This speed lace hardware is not only secure but also rust-proof. This boot further sports 6-inch premium waterproof leather padded collar for comfort. This is in addition to a gusseted tongue that prevents outside elements from entry into the boot. With this boot, your feet remain aerated throughout your trip owing to the Gore-Tex membrane whose microscopic pores let sweat out. This boot has a seam-sealed waterproof construction. It entails heavy padded waterproof leather uppers coupled with a Gore-Tex membrane. The Gore-Tex membrane succeeds to keep water out with just enough ventilation to keep your feet from being too hot. The leather and textile make of this boot account for its durability though the textile construction makes the boot prone to scraping. Gore-Tex membrane for breathability and water resistance. If you are going for a rugged look then the Vasque- Women’s Talus Trek Ultra-Dry hiking boot is just the boot for you. You can also choose from the gargoyle/ damson, slate brown, balsam green and slate colors that it comes in. Weighing 17 ounces each, these boots are relatively lightweight. Although it has a rugged exterior, this boot’s interior is far from that. Its molded EVA midsole and dual density foam insole have ample cushioning to give you that athletic feel. These two enhance underfoot comfort. Further, its Vibram Nuasi rubber outsole utilizes XSTrek rubber compound and multi-directional lugs whose great traction provide an outstanding trail performance on uneven terrain. To add to the comfort and stability, this boot features a rubber sidewall wrap that also protects your feet on rocky terrain. It also sports Ghillie lacing; a simple speed lacing system that secures your feet. This is in addition to adequate ankle support that ensures your feet will not hurt after long hours of hiking. This footwear further requires no break-in as they are comfortable right out of the box. The polyamide mesh this boot features offers great ventilation. This air permeable but waterproof feature will give you that cool feel throughout your adventure. With these boots, your feet are sheltered from water and debris owing to the very robust 1.8mm waterproof nubuck leather used to make it. This solid material is very resistant to outside elements. It also features an ultra-dry liner that’ll keep your feet dry as water cannot penetrate from outside while moisture can evaporate from inside. This is a high quality hiking footwear made of leather and synthetic material. It features abrasion-resistant polyamide mesh as well as deep-rooted rubber footprint that contribute to the boots’ durability. This hiking boot is available in bungee cord, granite, boulder/blush, espresso, falcon and grey/periwinkle colors. Best for narrow feet, these boots run small thus it is advisable to go up one size for an ideal fit. In spite of their tough construction these boots are surprisingly lightweight, weighing only 15.7 ounces each. Being a mid-cut boot, this boot offers great ankle support. Moreover, it is extremely sturdy due to its suede leather/mesh make which enhances the boots functionality but unfortunately trades off its flexibility. Additionally, this gear features an EVA contoured foot-bed that has added arch and heel support. Its insole is also removable so you can fit orthotics. For further comfort, it sports a Merrel air cushion which functions as a shock absorber as well as a means of enhancing your stability on the go. With Vibram traction, that provides great grip on uneven terrain and a protective toe cap to bar rocks from harming your feet, this product is a must-have. Lastly, the molded arch shank it has, offers support for you and your load and enhances the performance of this boot. With a closed-cell foam tongue that keeps both moisture and debris out, your feet remain cool in this boot. Your feet will also remain dry owing to M select DRY, a waterproofing system instilled in this boot, which seals water out while you are on the move. Not only is the suede leather/ mesh material used to make this boot extremely durable but it is also abrasion-resistant. This carefully designed boot with occasional logo accents will leave you spoilt for choice as it comes in an array of colors. You can choose from taupe/ sepia, stone, espresso/ berry, black, dark grey/ navy, slate/ eggplant, black blackberry, gray/ blue, anthracite/ denim, graphite/ jade, gray, red, anthracite/ lilac, anthracite, reed/honey, brown, slate/camel, Braun, sepia, espresso/honey or Schwarz colors. This is another relatively lightweight pair weighing 19 ounces per boot. It is designed to support light packs of up to 25 pounds, a factor that may be limiting to some and thrilling to others depending on the nature of your hike. This boot ranks best in terms of ankle support due to the Codura ankle band it integrates. If you have a tendency to roll your ankle then this is just the boot for you. Its derby-style lacing system allows a secure and supportive lace around the ankle as you can loosen or tighten them as you deem fit. It further features a removable insole that reinforces the installation of orthotics. 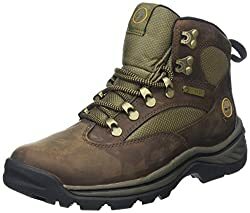 To enhance your comfort, this boot’s manufacturers integrated a leather upper that will successfully reduce the strain on your toes especially when descending a hill as it holds your foot in place. Integrated in the boot is also a Monowrap midsole which not only reduces the boot’s weight but also provides extra cushioning and lateral stability. Especially thrilling is the fact that these boots require no break-in. Just put them on and you are ready to go. For that good traction and grip on uneven terrain, the boot is backed by a Vibram outsole with thick non-slip rubber lugs. It also features a full-length nylon shank for greater stability and support on rugged terrain. Walking in these boots is truly a breeze for women as they feature a narrower heel and specially contoured padded tongues that offer exceptional comfort. This boot sports a moisture wicking foot-bed that allows air circulation and minimizes friction on your feet. Its Gore-Tex lining also reduces hot spots for comfort in warm temperatures leaving your feet cool, dry and free from blisters. The water repellent nubuck leather upper integrated into this boot keeps them waterproof with no need for extra sprays or treatments. Embedded in the boot is a Gore-Tex lining whose water resistance further keeps your feet dry. The all leather design this boot has keeps them free from wear thus it is very durable. Rest assured that you can put countless miles on these boots, through any type of terrain and they will still hold up well. This sleek boot is available in Detroit/ autobahn/ hot pink, nightshade grey/ deep blue/ coral and grey denim/ deep blue/ Lucite green colors. Weighing 14.1 ounces per boot, this pair is outstandingly lightweight. It is designed to support a 20-30 pound pack as its sole is not reinforced enough to carry more than that without tiring your calves. This boot with a mid-height upper is embedded with a sensifit system that supports your foot all-round for that precise fit. Aside from that, its toe room is spacious enough to allow natural foot swelling. This boot has also been constructed with running shoe technology. It has an advanced chassis entailing the combination of an EVA midsole, TPU chassis and Contra-grip outsole for stability, foot control and protection. The midsole ensures that you endure less fatigue while its contra grip outsole has an aggressive tread pattern that gives you great traction on rugged terrain. They are also crampons-compatible thereby enhancing your ability to manoeuver through snowy areas. With a protective heel cap and protective rubber toe cap, your confidence while hiking in these boots can only be enhanced. Not only will you be confident but also stress-free owing to this boot’s gusseted tongue that bars debris from entry. This women-specific boot requires no break-in; you can comfortably go on a hike with these right out of the box. Be it on rugged, wet or muddy terrains; your comfort is promised. For ventilation, this boot features Gore-Tex membrane with a mesh outer. This system regulates heat flow leaving your feet cool during the hike. The Gore-Tex weather protection system it has also ensures that feet are secure from water when walking through puddles and ankle-deep soggy areas. The durability of this boot is assured due to its textile/ nubuck leather make. This boot boasts of a Contragrip insole whose making entails a mix of compound density and lug geometry to create a durable tread that is lightweight. This functional yet elegant boot is available in appealing colors ranging from delta/ red velvet, mud/eve, black/ poppy red to quarry/ cool wave. Weighing 16.3 ounces each, this is another lightweight hiking boot. These boots are the epitome of comfort laced with functionality. To begin with, they remain true to size meaning that you will not need to size up for that ideal fit. They also feature a compression-molded EVA foam midsole with Techlite cushioning and Triangular D-ring and clamshell lacing entailing a hook and loop closure system. All these enhance the comfort of your feet. In addition, its Omni-grip lugged outsole will give you confidence while treading on rugged terrain as they have great traction. Although this boot is true to size, its stiffness may be unappealing as it might result in pain in the toe area. This boot sports a breathable mesh that offers ventilation so that your feet remain cool and fresh on the go. With its waterproof full grain leather featuring Omni shield water and stain resistant compression-molded Eva foam midsole, your feet will stay dry as water will not seep in. You are thus assured confidence while walking through morning dews and streams. Made of PU-coated leather, nylon and rubber material; this boot will serve you through years before eventually giving in to wear. The Forsake- Patch Women’s Waterproof Premium Leather hiking boot is available in these seven colors; black/tan, brown/ navy, grey/ cypress, timberwolf, sand/coral, burgundy and grey/ ocean. Depending on the size, these boots weigh between 12 and 16 ounces each. This weight is ideal for lightweight hiking boots. This footgear runs big in size thus going half a size down is recommended. It has been designed with craftsmanship for rugged areas providing great ankle support without the stiffness. Its peak-to-pavement outsole has wide outer lugs that offer great traction. It also has an open cell PU foot-bed for long-lasting cushioning and support. Moreover, its EVA cupsole has an integrated composite shank for more support. This boot is practical for many occasions due to its sneaker-boot design that makes it appropriate for both rugged outdoors and everyday usage. These boots integrate a Hydro-guard seam-sealed internal membrane that keeps moisture out. They are also embellished with sweat-wicking linings with anti-microbial treatment to keep your feet not only dry but also fresh. This boot is made of premium waterproof leather. Furthermore, its gusseted tongue prevents water and debris from entering the boot through the lace eyelets. The Patch is made of full-grain leather, suede and a heathered textile. The full-grain leather is attributed for its longevity as it is both durable and abrasion-resistant. The Forsake- Patch Women’s Waterproof Premium Leather hiking boot hosts an innovative smell-resistant foot-bed with anti-microbial treatment. The only other waterproofing system that has this installation is KeenDry. Furthermore, each pair ships with an extra set of nylon laces allowing you to customize your look by alternating them. The Danner- Women’s Mountain 600 4.5” hiking boot comes in brown/ red and hazelwood/ yellow. Weighing 15 ounces each, this hiking boot is extremely lightweight. This product features Vibram Specialized Performance Elastomer (SPE) midsole that offers better comfort and flexibility. It also has a unique co-polymer blend of synthetic natural rubber and EVA to improve the resilience, cushioning and durability of the boot. All this while minimizing on weight and maintaining the functionality of traditional EVA. The Vibram Fuga Outsole it hosts has mega grip with unique self-adaptive lug patterns that promote good traction at different angles. The combination of SPE midsole and Vibram Fuga outsole further creates the perfect balance of flexibility and traction. With a shank nylon for support, this boot is a necessary addition to your hiking escapade. This boot is lined by Danner DRY, a barrier that allows moisture to escape leaving you with enough ventilation around your feet. Its waterproof suede upper can survive in the wettest conditions. This is backed by Danner DRY, a waterproofing system that ensures that water cannot get into the boot while passing through wet terrain. These boots’ uppers are made of rich, thick suede that offers superior abrasion-resistance and durability. Some boots maximize on your level of comfort while others forego this and venture into the water-resistance and grip. This might leave you confused when scouting for hiking gear. Here’s a list that you can use to find your ideal hiking boot. The amount of cushioning, level of grip, stiffness and type of material used to make a hiking boot, all contribute to the amount of comfort you will experience in them. Midsoles provide cushioning, shock absorbency and have a huge say on a boot’s stiffness. Most of them are either made of Ethylene vinyl acetate (EVA) or polyurethane (PU) material. Although EVA offers more cushioning while PU is firmer and more durable. As for internal support, boots integrate shanks between the midsole and outsole to add to the stiffness of the sole. The stiffness of a boot, although some may find uncomfortable, protects your feet from being bruised by rocks. Avoiding any injury by slipping on terrain is dependent on how well your boot can grip any terrain. The most common material for boot outsoles is rubber. Other additives can also be featured to increase the hardness of the outsole however it is the lug pattern that dictates the amount of traction that your boot has. The thicker and deeper the lug pattern the better the grip. Some technologies also improve your grip. These include Vibram Megagrip which offers maximum grip on slippery terrains. Other boots feature TPU construction entailing no seams or inserts. This lack of stitching delivers a comfortable fit. Compare these additives to determine how comfortable your boot will be if you are shopping online. 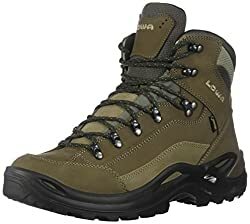 Most hiking researchers agree that lightweight hiking boots are designed to weigh anywhere between 15 and 20 ounces each. Opt for a boot whose weight is close to or within this range as the minimal weight will give you one less thing to worry about while hiking. In order to determine whether your gear will serve you long-term or not, look into the type and quality of the material used to make it. REI ranks hiking boot durability starting with those made of full-grain leather, then split-grain leather, followed by nubuck leather and then synthetic leather. The disadvantage of full-grain leather however is that it does not offer as much ventilation as nylon. It also requires more break-in time. Split-grain leather, on the other hand, is basically combined with nylon mesh to add a breathable and lightweight feature. However, this lowers water and abrasion resistance as the leather covering decreases to accommodate nylon and its benefits. Another material is Nubuck leather which, although ranking behind full-grain and split-grain leather, is still durable and flexible. It is water and abrasion resistant and would also require to break-in before achieving comfort. Lastly, there’s synthetic leather, nylon and polyester which are lightweight and break-in easily but are prone to wear due to the outside stitching. You are definitely going to take these footwear outdoors meaning that there is a very high likelihood that you will run into water. ExpertWorldTravel lists Keen and Gore-Tex membranes as the best waterproofing systems for footwear. KEEN.DRY membrane works by combining with the breathable and waterproof materials of a shoe whereas Gore-Tex membrane is made of more than 9 billion microscopic pores that give its aeration and waterproof features. Keen.Dry only wins over Gore-Tex by being more breathable and incorporating Cleansport Odor Control that works to deter odor from the sweat likely to surface from your feet. Other coatings come second to these two in terms of waterproofing performance. Additionally, the type of material used to make a boot also has a say on its level of water-resistance. According to REI, Full-grain leather has excellent water resistance as compared to split-grain and nubuck leather. Look into whether your hiking boot incorporates a ventilation system to aerate your feet. Most boots incorporate Gore-Tex fabric which functions by allowing excess heat from your feet to escape through its microscopic pores. It is important to know the length, width and arch length of your foot and then measure it against a boot before purchasing one. Some stay true to size while others like Danners Women’s Mountain 600 run half a size up. In the same way, other boots runs half a size down meaning that the boot that you purchase has to be half a size higher than normal. Know your measurements and use appropriate sizing charts before purchase. Also, key in that the size you decide to purchase has to accommodate thick socks and natural foot swelling for that perfect fit. You are always looking for the perfect comfortable fit with waterproof and ventilation enhancements. So what happens when you are torn between two shoes that have ticked every box in your check list? Opt for extra features such as odor repellence. Some boots feature anti-odor features such as Cleansport NXT that will keep sweat odor at bay. Other boots feature synthetic insulation for warmth while hiking on snowy areas. You never know, this might just be the extra push that might help you choose your hiking boot. Compare the prices of the boots if you are still undecided and go with the boot that is worthy. By following this guide, we guarantee that you are now fully equipped and well on your way to finding your ideal hiking boot. Leave a comment below to let us know what your thoughts are.